If it is going to be your baby’s first Christmas this year, why not make it that little bit special with some of these ideas. Baby’s first Christmas is the perfect opportunity for you to create your own new family traditions. Perhaps this will be the first Christmas you spend in your home rather than visiting parents or relations. Maybe you will decide to always drink sherry at midnight or dance around around the tree. Whatever you want to do, having a new family means you can make your own Christmas story so let your imagination run free. Don’t forget to document it, we love the idea of using a polaroid camera and photo book to scrapbook the build up and the day and it’ll be a nice keepsake. Check out Amazon, Argos, Boots and John Lewis where you’ll be able to purchase a polaroid camera and scrapbook. Why not make Christmas cards with your baby’s hand or footprints? Make sure you use a non-toxic paint and clean baby’s feet and hands thoroughly afterwards. Use festive colours such as red and green or metallic paints in silvers and golds. So pretty! You could make a special decoration for the tree customising it with the date of baby’s first Christmas. Lots of retailers make personalised decorations from baubles and wood cuts to felt toys including GLTC who you can save 5% with. If your baby is weaning, blend up some of the elements of the adult’s Christmas dinner such as veg, a little turkey and some of your baby’s usual milk feed. Yum! (You can also freeze some of the mixture for later feeds.) Pull your baby’s high-chair up to the dinner table so they can be part of the fun. Just watch out for the tiny toys in some Christmas crackers which are not always baby friendly. Young babies are sensory creatures meaning that they really do ‘feel’ the world around them. Take every opportunity to think about what your baby sees, smells and feels around the Christmas period. Think of Christmas smells such as cinnamon and oranges, the sight of twinkly lights, the sound of bells; all these things will stimulate your baby’s development. 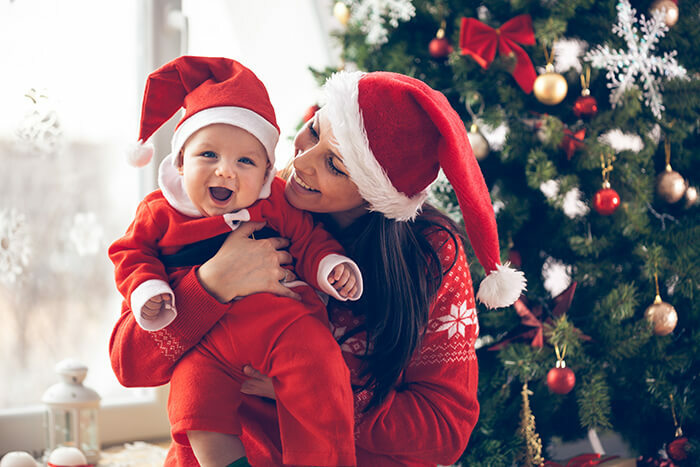 Last but not least, baby’s first Christmas is probably the one and only time your child will let you dress them as a pudding or an elf. What can I say but… seize the day! John Lewis have an adorable range of festive onesies from reindeers to elves to polar bears. Don’t forget to use KidStart when doing your Christmas shopping, you can save up to 25% on over 1500 major retailers!